Ottawa, ON, February 15, 2017 – According to statistics released today by The Canadian Real Estate Association (CREA), national home sales were down slightly in January 2017 on a month-over-month basis. National home sales declined 1.3% from December 2016 to January 2017. Actual (not seasonally adjusted) activity in January was up 1.9% from a year earlier. The number of newly listed homes dropped 6.7% from December 2016 to January 2017. 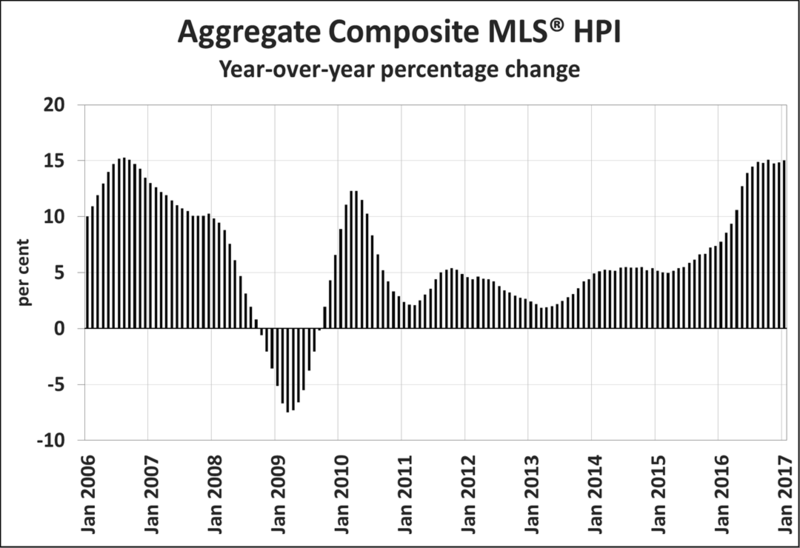 The MLS® Home Price Index (HPI) in January was up 15.0% year-over-year (y-o-y). The national average sale price was little changed (+0.2%) y-o-y in January. 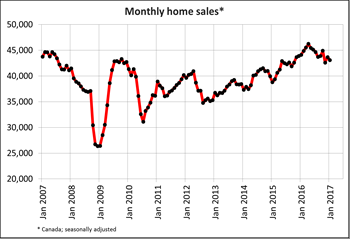 Home sales over Canadian MLS® Sys tems edged down by 1.3% month-over-month in January 2017, putting them at the second lowest monthly level since the fall of 2015 and only slightly above levels recorded last November when recently tightened mortgage regulations came into effect. Sales activity was down from the previous month in about half of all local markets, led by three of Canada’s largest urban centres: the Greater Toronto Area (GTA), Greater Vancouver and Montreal. 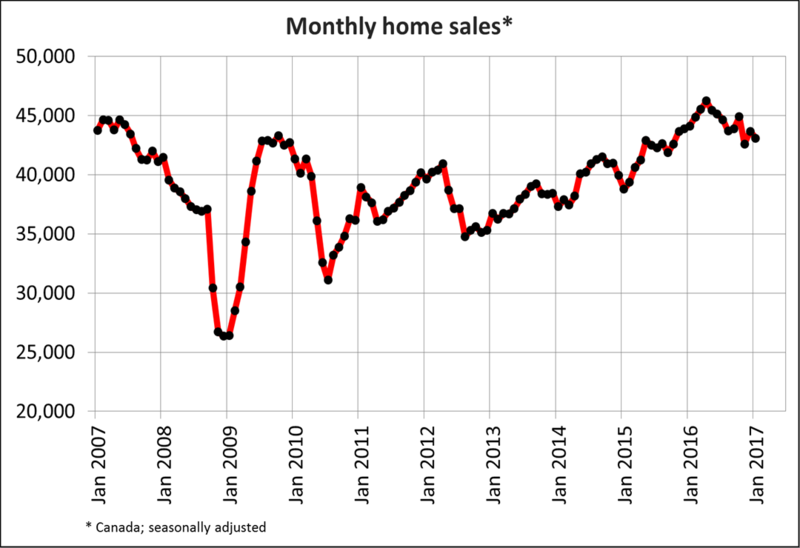 Actual (not seasonally adjusted) sales activity was up 1.9% compared to the same month last year. While sales were up from year-ago levels in about two-thirds of all local housing markets including in the GTA, Calgary, Edmonton, London and St Thomas, and Montreal, they were down significantly in the Lower Mainland of British Columbia. The number of newly listed homes dropped 6.7% in January 2017, the second consecutive monthly decline. New listings were down in about two-thirds of all local markets, led by the GTA and environs across Vancouver Island. With the monthly decline in new listings surpassing the decline in sales, the national sales-to-new listings ratio jumped to 67.7% in January compared to 64.0% in December and 60.2% in November. The ratio was above 60% in about half of all local housing markets in January, the vast majority of which are located in British Columbia, in and around the GTA and across southwestern Ontario. A monthly decline in newly listed homes further tightened housing markets that were already in sellers’ market territory. There were 4.6 months of inventory on a national basis at the end of January 2017 – unchanged from December 2016 and a six-year low for the measure. The imbalance between limited housing supply and robust demand in Ontario’s Greater Golden Horseshoe region is without precedent (the region includes the GTA, Hamilton-Burlington, Oakville-Milton, Guelph, Kitchener-Waterloo, Cambridge, Brantford, the Niagara Region, Barrie and nearby cottage country). The number of months of inventory in January 2017 stood at or below one month in the GTA, Hamilton-Burlington, Oakville-Milton, Kitchener-Waterloo, Cambridge, Brantford and Guelph. The MLS® Home Price Index (MLS® HPI) now includes Oakville-Milton and Guelph, and has been historically revised to ensure that all aggregate measures remain comparable. The Aggregate Composite MLS® HPI rose by 15.0% y-o-y in January 2017. This was up slightly from December’s gain, reflecting an acceleration in apartment and townhouse/row unit price increases. Prices for two-storey single family homes posted the strongest year-over-year gains (+16.8%), followed closely by townhouse/row units (+15.8%), one-storey single family homes (+14.4%) and apartment units (+13.3%). While benchmark home prices were up from year-ago levels in 10 of 13 housing markets tracked by the MLS® HPI, price trends continued to vary widely by location. In the Fraser Valley and Greater Vancouver, prices have receded from their peaks posted in August 2016. That said, home prices in these regions nonetheless remain well above year-ago levels (+24.9% and +15.6% respectively). Meanwhile, benchmark prices continue to climb in Victoria and elsewhere on Vancouver Island together with Greater Toronto, Oakville-Milton and Guelph. Year-over-year price gains in these five markets ranged from about 18% to 26% in January. By comparison, home prices were down 2.9% y-o-y in Calgary and by 1.0% y-o-y in Saskatoon. Prices in these two markets now stand 5.9% and 4.3% below their respective peaks reached in 2015. Home prices were up modestly from year-ago levels in Regina (+3.8%), Ottawa (+3.7%) and Greater Montreal (+3.1%). In Greater Moncton, home prices for the market overall held steady (-0.2%), reflecting an increase in townhouse row units prices (5.8%) that was offset by a decline in prices for one-storey single family homes (-1.0%). The actual (not seasonally adjusted) national average price for homes sold in January 2017 was $470,253, almost unchanged (+0.2%) from where it stood one year earlier. That said, Greater Vancouver’s share of national sales activity has diminished considerably over the past year, giving it less upward influence on the national average price. The average price is reduced by almost $120,000 to $351,998 if Greater Vancouver and Greater Toronto sales are excluded from calculations.